If a woman swears to find the truth, she eventually does. And if someone her own needs justice, she would turn the world upside down for justice. 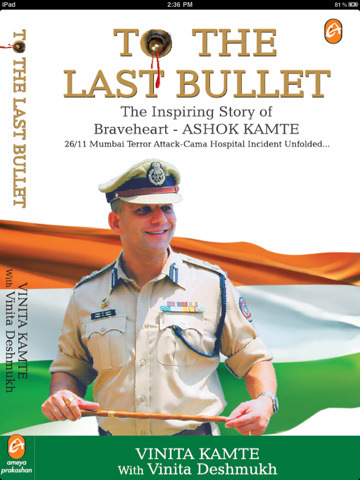 You can witness this through an author of this book Ms.Vinita Kamte. She lost her husband and country lost one of the best IPS officers during attacks of 26/11 in Mumbai. And he is Former Additional Commissioner of Eastern region of Mumbai, Late The Ashok Kamte. Along with Ashok Kamte, there were 18 other policemen including ATS chief Hemant Karkare and PSI Vijay Salaskar, who died with the bravery to save innocent lives. I am sure, everyone must be remembering their whereabouts on 26.11.2008 when news of cowardly attacks carried out by 09 Lashkar-E-Toiba terrorists broke out. 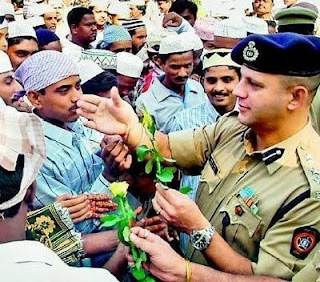 Mumbai Police was trying its best to restrict the terrorists. A damage had already been done within 3- 4 Hrs of commencement of attacks. The aim of a police force was to stop further loss of innocent lives. "IPS officers Hemant Karkare, Ashok Kamte and PSI Vijay Salaskar have been shot by terrorists at Cama Hospital. They couldn't offer any resistance due to lack of preparation while confronting the terrorists and died in a vehicle itself. " But was it all true?? Were such brilliant and proven police officers could deal such situation with cowardice? Had they asked Police HQ (At a distance of 500 from the site) for backup ?? All these questions were unanswered. Or we can say, no one bothered to ask it to High Commands in Police force. Vinita had lost her love of life in form of Ashok Kamte. She had been disheartened by the questions raised by authorities about a bravery of her husband. After recovering from grief, she pledged to check every possibility, which could bring justice to all honest and brave officers like Ashok. It wasn't about credits but dignity. After starting to question the bureaucratic authorities, deniability was the immediate reaction. When Police dept. crossed off her application for records of satellite conversation between the control room and her husband as well as Hemant Karkare, she used a weapon of RTI (Right to Information) and found out very startling truths about the hypocrisy of higher authorities. She knew that legally or actually she couldn't challenge those who were at fault. So, she came up with the book, " To the last bullet". The truth is that Karkare radioed the control room at 23.24 hrs and three officers drove to the front gate of expecting backup support must have been reached in time. But there was no single policeman spotted, and Kasab and Ismail Khan welcomed them with bullets. 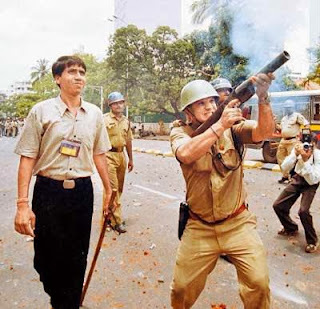 Even in such a deadly attacks, Ashok Kamte opened fire with his AK-47 and injured Kasab's hand. After injuring three officers, Kasab and Ismail threw them on road. After the escape of terrorists, injured bodies of Ashok Kamte, Hemant Karkare and Vijay Salaskar was lying on a road, helpless. The answer is nation lost its brave officers, due to the negligence of higher authorities. Cover page of the book itself awakens your mind with smiling and satisfied man. 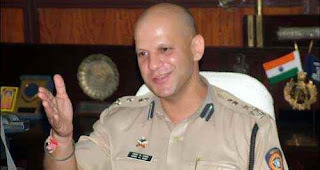 From the photo, you would realise that Ashok Kamte was made for being a policeman. 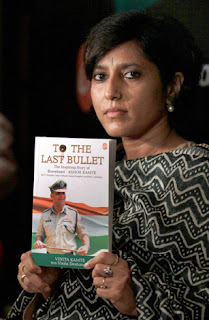 Vinita Kamte has covered her findings of her own investigation of 26/11 situation handling by police and alongside she takes us for a ride to witness working style of Ashok. She describes his stints as a Superintendent of Police at Bhandara, Solapur, Satara and Sangli districts. Book also shows Ashok's two sides of coins i.e about being hard with criminals and soften with innocents. One chapter of the book covers the life of Ashok's grandfather, who was commissioner of Police during British era in India. This part feels too lengthy and bit irrelevant to the core subject. Above all, I recommend this book for all genre. Because, all citizens must know, how our heroes worked and dreamed of clean and clear society. Note: I know, Above words might not be perfect, but feelings and views are genuine. 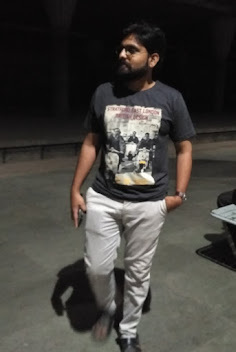 To make my blog to be perfect and lovable, kindly let me know your comments in the box below.